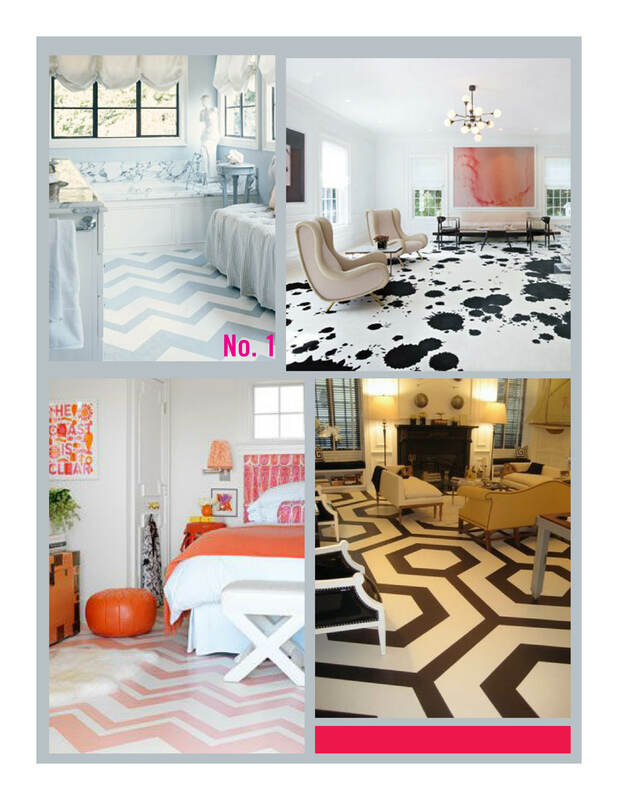 Just because you step all over them doesn’t mean your floors can’t step up their game and get noticed. Whether you choose to: tile them, paint them, pickle them, polish them, cover them with Persian carpets or go wall to wall selecting your medium is only the beginning. There are endless ways in which you can make a statement and let us not forget that nagging voice of reason – practicality. If ever there is a place to begrudgingly agree …give that voice the floor. Brownstones – those old five story buildings that line the streets in most Boston neighborhoods and have been showcased in so many Hollywood Movies they should be millionaires many times over, are where I prefer to make my nest. The floors are typically wood if they are original, wider pine boards, which look beautiful if they are natural and in my humble opinion, a little less so if they are stained pumpkin. Brownstones that have been renovated in the last 50 years often have thin, natural oak floors, popular for their durability and economy (two decidedly unsexy words). A bit of advice, if your home has original wide pine floors – regardless of your feelings towards them – keep them. If you like money, the charm and character they bring will make them that much more attractive to you. Another unvarnished truth about that character and charm is that it comes with many decades behind it. The floors may not be fit for sanding, pickling, staining and refinishing. Years of grinding can compromise their strength, which has its limits. While you can add polyurethane, please be kind and don’t subtract anything – they’ve experienced their fair share of being walked on. If you must, cover them with a gorgeous area rug and let that be the true expression of your style. Brush on a little personality. I am a huge fan of painting floors. 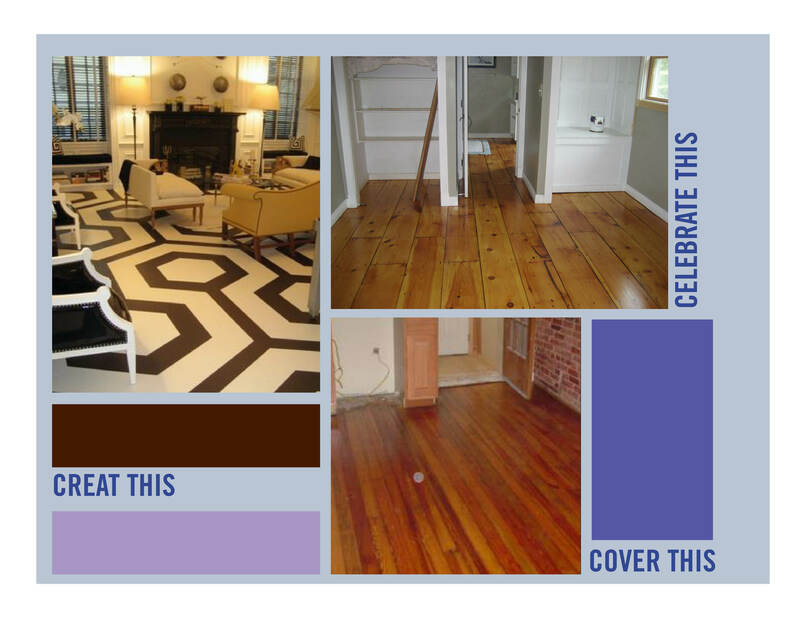 I once painted my kitchen floor in the manner of the gray and white chevron bath seen above in image No. 1. Tile can be tough to stand on for long periods of time and wood is still a really economical option. I poured some serious doe into those 47 little feet. Stunning appliances, a knock out marble counter and vertically oriented subway tiles….it should have been a show stopper…who would have guessed two cans of paint and some frog tape would make such an impression. To be clever or rich….which would you choose? Still I wouldn’t have changed a thing, and I am glad for the lesson. I do hope you will find it useful.